I feel like I’m always using this phrase: ‘It’s an exciting time to be working with web type right now.’ But it’s true, isn’t it? With enhanced browser support, the refinement of font delivery services, intelligent discussion surrounding screen rendering, and the emergence of a set of standards, it really is an exciting time for typography in web design. Invest money in typefaces. I get seriously angry when people don’t buy fonts; it’s a type designer’s lifeblood, and if we deserve to get paid for our design work, so do they. However, this post is about the scenario where the end use of a font is web design, and quickly throwing together a mock-up in Photoshop before writing CSS shouldn’t require spending several hundred £ / $ / € / etc. on a desktop licence. It’s worth noting that this is only a concern with paid fonts. Obviously free fonts (such as those available from Google Web Fonts or Font Squirrel) allow you to download and serve via @font-face. I try to spend as much time possible designing in the browser and these days I only use Photoshop for rough ideas, general directions, and quick mock-ups. However, from my point of view, that’s still enough time spent in the app to warrant the need for typeface choices beyond those I have installed on my system. MyFonts offer a great system where you can buy a greatly-reduced web font licence when you buy a desktop font. However, what we need is effectively that in reverse. Although not specifically related to web fonts, Underware have a very interesting model, whereby they send potential customers a sample CD containing all of their typefaces, and allow designers to try the fonts out. If they use them for a project, it is then up to the designer to be honest and purchase a licence from the foundry. This trust-based model is a brave move, and although Underware should be commended for such bravery, it’s understandable that many foundries just don’t see this as an option. It’s a shame, because this could solve the entire problem I’m talking about here, but sadly we don’t live in a world where people can be relied upon to be trustworthy. Last year, Jason Santa Maria wrote an excellent blog post in which he highlighted the need for a real web design application and mentioned the desire to use external fonts and / or the WOFF format. I’m behind him all the way. Everyone agrees that Photoshop is not really suited to the web, and it’s fair to say that Fireworks — despite its purpose as a tool for screen-based design — falls short. Ironically, it’s InDesign that comes closest, with its style-specific menus that — as Jason pointed out — are much closer to the way we work with CSS than anything present in current versions of Photoshop or Fireworks. It’s my firm belief that a new app created specifically for web design would be snapped up in an instant by virtually every designer in our industry. 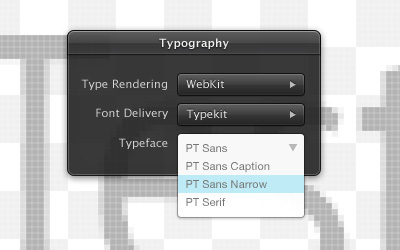 At the very least, I think there’s a very real need for a tool that displays typeface choices via an online service and, importantly, renders the fonts using an actual browser rendering engine. If the right people got together and set the wheels in motion for this to become a reality, we could make this happen.